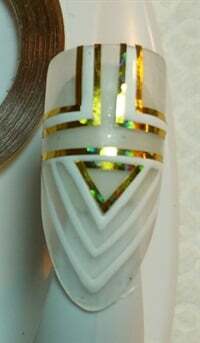 Tammie Alvarado (@tntalvarado316) of Tulare, Calif., shows how to make Art Deco wearable for a wedding. 1. After nail prep, use a striping brush and white gel-polish to add a backwards L in the top left corner. Leave a space in the center and add another L in the top right corner. Leave a space directly below the two L shapes then add a diagonal stripe. 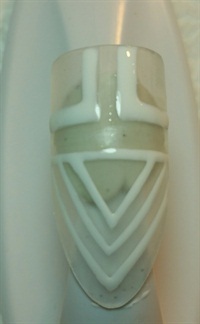 Layer V patterns to fill in the nail and cure. 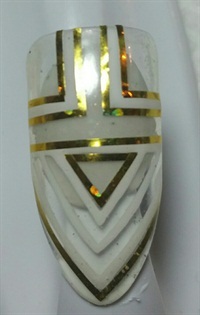 2.Line geometric art with gold striping tape. 3. Add clear gel over the entire nail and cure.